When I went shopping a little while ago I decided to go a bit out of my comfort zone and try on some things that I wouldn't usually buy. It turns out that I actually loved some of the things I tried on, included a few pieces that were embroidered. Since then, I've been all over this embroidery trend. I think it adds something to an outfit, especially if the design is a gorgeous design. 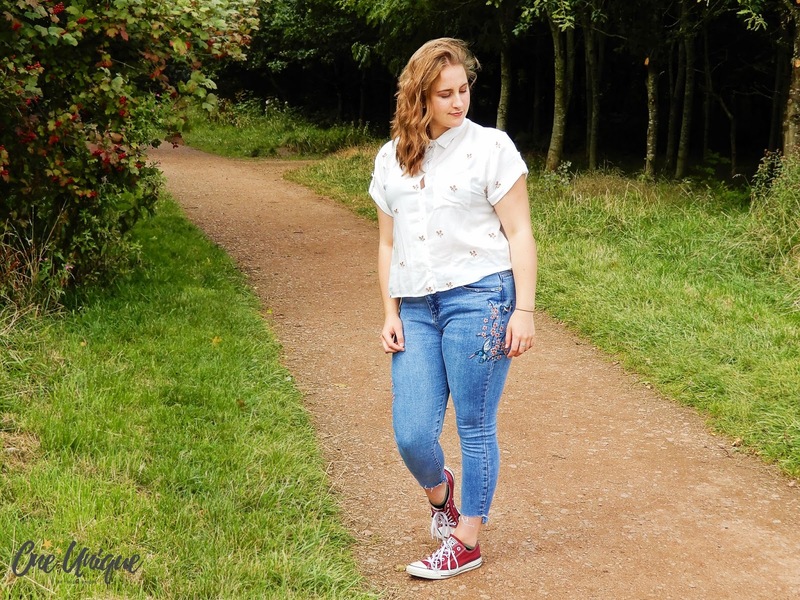 First up, I have the gorgeous jeans from New Look. At first, I was a bit apprehensive about the bottom of them, the front is higher than the back, hell no! But I've slowly warmed to them and now embrace the individuality of these jeans. Before, I used to turn the bottom up a few times so they were half way up my shins. You can't see from this picture, but there is some embroidery on the other leg too which is just as beautiful as this leg you can see. I just can't get over how cute this design is! On the other leg, there is a few more of these blossom branches, surrounded by a couple of butterflies. 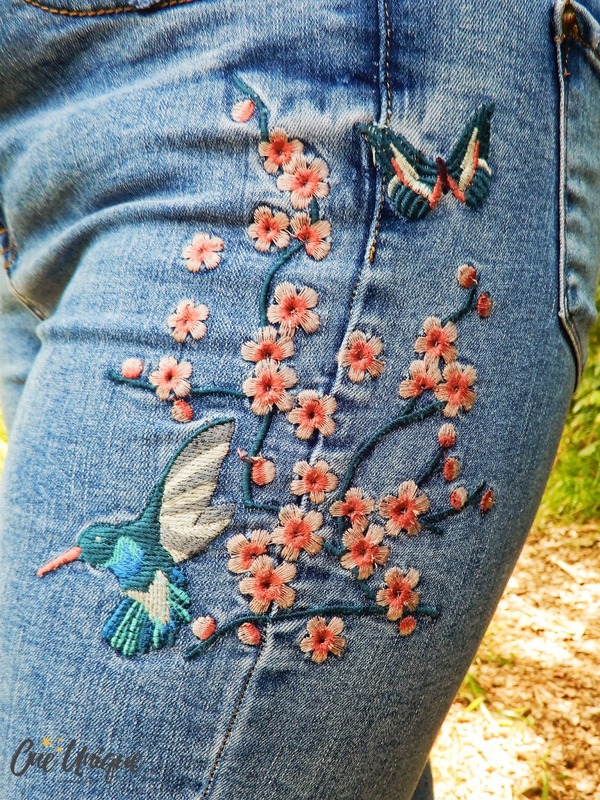 I think that this embroidery just makes these jeans look amazing, I love to wear them with a bright pink strapless flowy top from Primark. Unfortunately, these are no longer on the shelves but you can browse through New Look's embroidered jeans here. This shirt if from New Look too, there are quite a few options in this design, I have a couple of these tops. 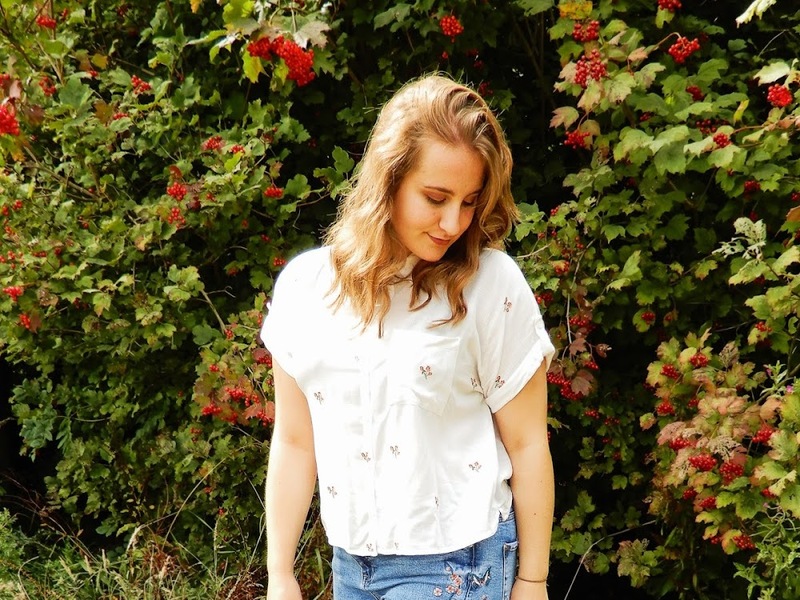 This is so delicate, I couldn't help but pick it up, made from cotton these cropped shirts are so comfy and look adorable! On this design there are small flowered embroidered over it and they are so cute. 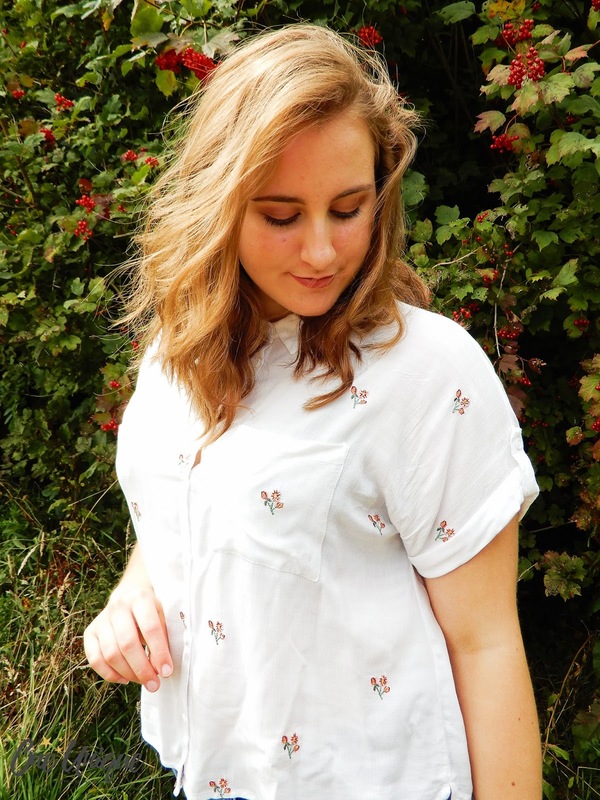 The sleeves are rolled up which adds to the gentleness of this top, I love how the material falls as it looks so delicate (and hides all the places you're never comfortable with!). I bought this for £14.99 and this style is no longer on the shelves either by the looks of it! But you can browse the same design, just without the embroidery, here. Apart from my worn, muddy Converse, I like this outfit and I will definitely try some more things out of my comfort zone again. 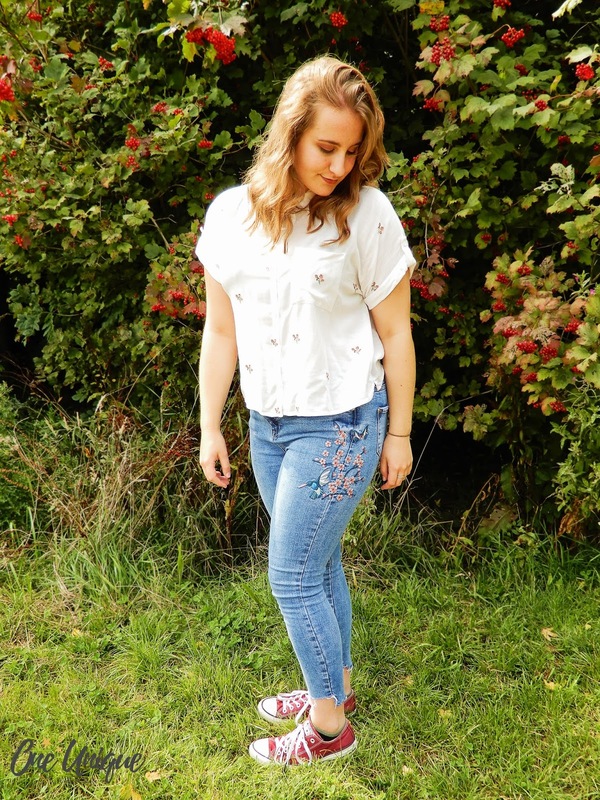 Embroidery is one of my new favourite styles at the moment, I'm pretty sure that every store you walk in, you'll be able to find something embroidered, so go and try on some new clothes and start wearing this trend! What trend are you loving at the moment? This is such a cute outfit!, you're super pretty btw. I am loving embroidery at the moment!!. You look so pretty 😍 This outfit is really cute, I love embroidery especially in denim. I really like the converse, even if they are mucky! It gives them charm! Quiz Clothing have some really nice embroidered pieces! 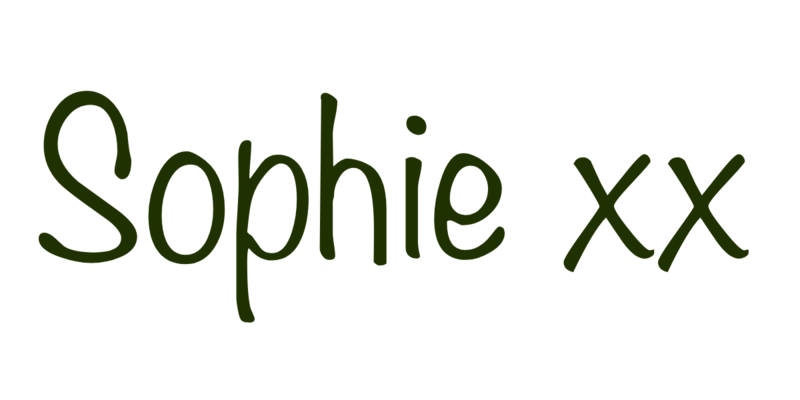 You look stunning, Sophie! I'm obsessed with those jeans, so pretty!